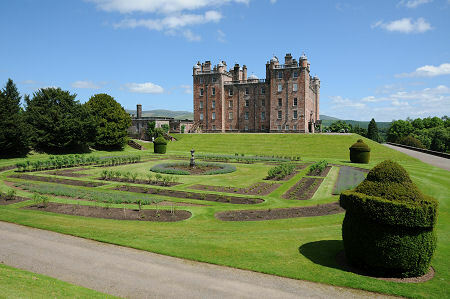 The story of Drumlanrig Castle and its close links with the Douglas family is set out in on our feature page about it. On this page we focus on the formal and informal gardens that surround the castle. Full information about opening hours and admission prices can be found via the links on our Drumlanrig Castle feature page. You approach Drumlanrig Castle via a road that leaves the A76 before crossing the River Nith and proceeding through the open parkland of the estate. This brings you to the north end of the Great Avenue, the tree lined drive that approaches the castle from the north. The aim is to give visitors a clear view of the castles' most ornate frontage as they approach, and it works. From the drive, and from the visitor car park to the north west of the castle, you could be forgiven for thinking that Drumlanrig Castle is set on a fairly level site. In reality the land slopes towards the River Nith, a few hundred yards to the east, and towards the Marr Burn, two hundred yards to the south. Drumlanrig Castle's medieval predecessor occupied a strong defensive position on a bluff, and if you remove from the picture the extensive landscaping and terracing undertaken over the past three centuries, it is still possible to appreciate the prominence of the location when seen from the east and south. The fall of the land has major implications for the layout of the gardens. The obvious starting point for any exploration is on the west side of the castle, because that is where you emerge after parking and visiting the visitor reception. Immediately to the west of the service areas of the castle is a formal section of the garden, beyond which is the castle's tennis court, whose immaculately trimmed grass surface and hedges are sadly undisturbed by games of tennis these days. Stray a little further from the castle in this direction and you come to the Beech Walk and the nearby bowling green. Further out again is the Duchess's Walk, a beautiful woodland area leading past the bog garden to one of the estate's heather huts. This offers a dramatic view down to a section of the Marr Burn running through a gorge. Close by is the first Douglas Fir planted in Britain, which has stood here since 1829. Another notable tree in this part of the garden is the Red Oak planted here in 1971 by astronaut Neil Armstrong during a visit to Drumlanrig. Immediately to the west of the castle itself, a slope descends to the West Parterre or Rose Garden. This formal garden was first established at the end of the 1600s, but has changed many times over the centuries before being grassed over during World War Two. In 1990 it was restored to a rose garden in the style of the Victorian era, with a series of decorative beds contained by a topiary yew at each corner. A slope from the south side of the castle leads to the great dividing line in the garden, the long terrace walk. This separates the castle and the West and East Parterres from the valley below, and as a result of large scale earthworks in the early 1700s is bounded on the south by a high stone wall that only offers descent to the lower areas of the garden at its two ends, some 200 yards apart. At its west end a series of grassy ramps bring you down to the level of the South Parterre or Shawl. This formal garden was created in the early 1700s, but had been grassed over within a few decades. It was re-established as a heather garden in 1829. To the east of The Shawl, and at a slightly lower level, is the Low Sand Garden, originally established as a flower garden in about 1700, and re-established in 1829. The yew trees along its northern side are among the oldest anywhere in the gardens. South of The Shawl and the Low Sand Garden the ground descends towards the Marr Water to what is known as the Low Ground. This started life at the end of the 1600s as a series of yew-hedged walks, but was later grassed over. Today the grass is mown decoratively, but the main interest is at the margin of the area, where beautiful planting and a rock garden descend to the river. Moving east from here brings you to the Wilderness, home to many of the estate's rhododendrons, and to another heather hut. On the far side of the river is the Cascade, a waterfall under restoration. The woodland to the south east of the castle is home to a spectacular adventure playground, while immediately to the east of the castle is the East Parterre, originally laid out in the years around 1700 and re-established as an American Garden in the early 1800s. The final highlight of the garden is best reached from the car park. To the north east of the castle is the Drumlanrig Sycamore, over 300 years old and the largest in Britain. 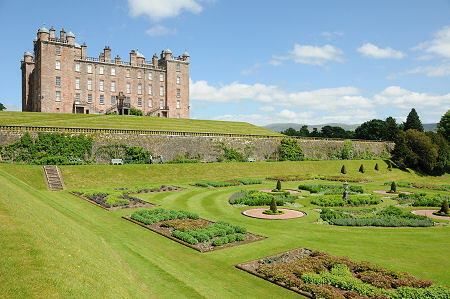 Drumlanrig Castle Gardens have had mixed fortunes over the centuries. Originally established when the the castle you see today was built at the end of the 1600s, they waned during the mid 1700s, only to be re-established during the Victorian era, when as many as 30 full time gardeners were employed. A further period of abandonment and return to grassland followed during the Second World War, and the story since has been one of carefully planned restoration, which is still ongoing. And as you wander around, bear in mind that what you see is the result of the efforts of just four gardeners.